Each day, crashes caused by distracted drivers in the United States injure 100 people and leave at least nine dead. The National Safety Council (NSC) has declared April to be Distracted Driving Awareness Month for this reason. Distracted Driving Awareness Month is an opportunity to acknowledge the dangers of, and eliminate preventable deaths caused by, distracted driving. 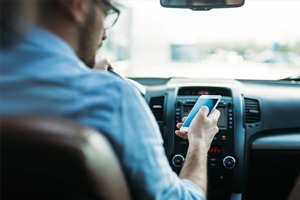 The Insurance Institute for Highway Safety (IIHS) and the Highway Loss Data Institute (HLDI) recently published the results of a new survey on distracted driving in the United States. The results indicate cellphone use while driving has increased 57% percent versus previous surveys. Even though citations for distracted driving decreased 5% across Pennsylvania between 2017 and 2018, one local source maintains distraction remains an issue. They note the overall number of citations has increased 118% in the last five years. In PA, law enforcement can issue distracted driving citations to those who either text or use headphones while behind the wheel. Violators face a $50 fine, court costs, and other related fees. If you or a loved one has been seriously injured in a car accident through no fault of your own, call the experienced Pennsylvania Car Accident Attorneys at Freeburn Hamilton for a free consultation. When you call, you’ll speak with a leading Harrisburg car accident lawyer for FREE. Freeburn Hamilton will fight hard to seek the justice and the compensation you deserve after an accident. Just call the 7’s for help at 717-777-7777 or 570-777-7777. There is no attorney’s fee due up front—and we only get paid after you do.